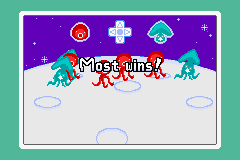 Strength in Numbers is a microgame found in the IQ folder in WarioWare, Inc.: Mega Microgame$!. It reappears in WarioWare Gold under Dribble and Spitz. 1.1 WarioWare, Inc.: Mega Microgame$! 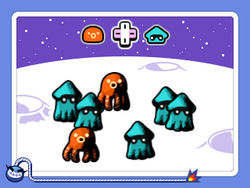 The objective of the game is to quickly count out if there are more octopuses or squids on-screen. 1st level difficulty: 7 specimens in total. 2nd level difficulty: 15 specimens in total. 3rd level difficulty: 23 specimens in total. 3rd level difficulty: 15 specimens in total. However, they vary in size. This page was last edited on April 10, 2019, at 22:27.